PROCESS : Similar to injection molding except hot liquid plastic comes out of the barrel vertically, in a hollow molten tube or “parison”. The 2 halves of the mold close on it and compressed air blows up the parison like a balloon, forcing it outward to conform to the inside shape of the mold. After cooling, a hollow part emerges. RAW MATERIALS : Most commodity grade and engineering grade resins may be blow molded. However, the “melt index”, or viscosity, of the plastic must be high to keep the parison from stretching too much prior to mold closure. The resin is in the form of pellets before processing. TOOLING : Machined or cast aluminum is traditional. COST : Part prices are generally higher than injection molded parts, but lower than rotationally molded parts. Tooling costs are moderately expensive. ADVANTAGES : This process lends itself to any designs involving hollow shapes. Equipment availability is good in most geographical locations. Can save tooling dollars over injection molding. DISADVANTAGES : Cycle times are slower than injection molding. Piece prices are higher than injection molding. 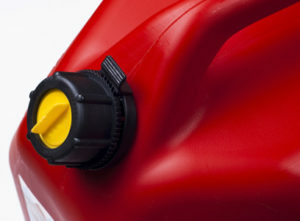 EXAMPLES : All types of bottles, toys, air ducts for automobiles, chemical & gasoline tanks, household goods.